Decorating your home needs some careful planning just like when you budget your family expenses. You need to consider several factors concerning the theme, motif, ambiance and harmony of colors and design. Some homeowners prefer coordinated designs in their flooring, kitchen, bathroom and even wall tiles to create a theme they want for their interiors so they choose materials that can be used for all areas. 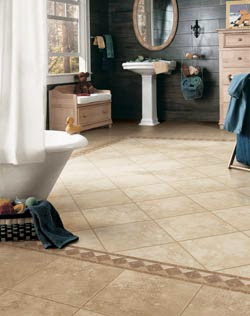 Well there are no other kinds of tiles that you can use throughout many areas in your house except ceramic tiles. It’s the only one who can stand up all requirements for floors, walls, sinks and counters. You can use it on murals, kitchen tops, countertops, bathroom, inner or outer flooring and in any other areas that you feel it may fit. One might ask why it’s the most-sought after tile when it comes to variety of usage, well it has noticeable advantage over some kinds of tiles because of its durability and resistance to water and scratch. It’s proven to be versatile on any areas of the house and very easy to maintain because you can clean it easily. These are the reasons why it’s the best choice for bathroom and kitchen tile as these areas are wet most of the times and needs cleaning several times a day. When it comes to style you can count on it to have various textures that will complement your taste and specific requirements. It’s available in bright and vibrant colors if you want the modern types but it also has natural earth tones in colors for those who want the classic and elegant type without being too sharp and bold in colors. Additionally if you have chosen the perfect tile you want you should make sure that you can get a reliable craftsmen who are experts in installation.